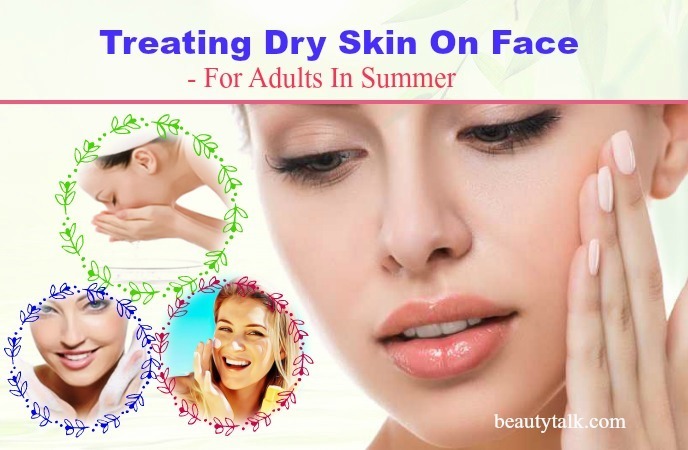 Anybody can struggle with the problem of dry skin on face at any time. It happens when the skin does not have enough oil or water. You may have this problem year-round, in the summer or the winter, when the humidity lowers and the temperature drops. It can affect your beautiful skin and your appearance. 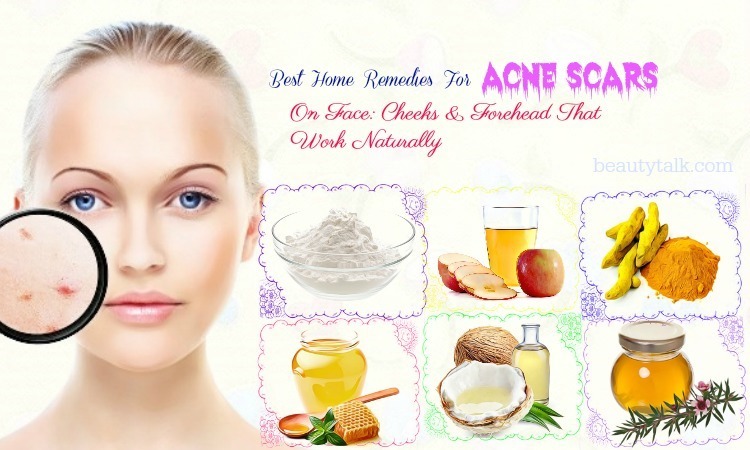 So, why don’t you go natural treatments to battle dry skin on face without any side effect? In this post on Beauty Talk, you will get the effective ways for both adults and babies to get rid of dry skin on face in summer and winter and the easy recipes that can make your skin supple and soft. 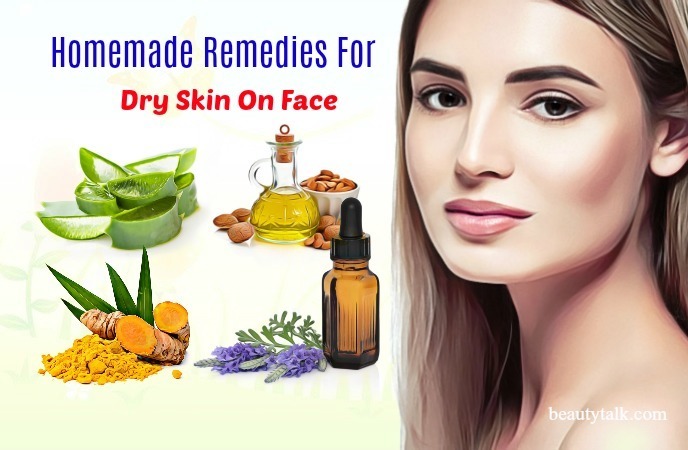 Essential oils for dry skin treatment: why & how to use them? Lots of factors, such as your age, lifestyle, and genes can cause dry skin on face. But, there is one easy solution to take care of these factors from within that is food. 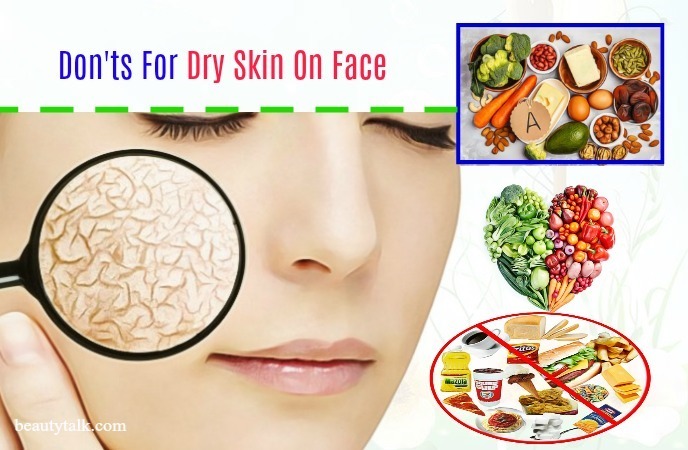 You can heal the dry skin quickly and naturally when you choose the right foods. Below are some of the best foods that will be helpful to hydrate and moisturize the skin while making it flawless and glowing in no time. Let’s get started! Consume fresh fruit juice and eat plenty of fruits every day to keep the skin hydrated and protected from the damage of free radicals. Fruits are abundant in water and antioxidant vitamins so that they’re therapeutic for dry skin. Fruits, especially citrus fruits, can help your skin produce collagen, giving it a plump, moisturized feel and look. If you eat the peel of the fruits, you’ll benefit from the high source of bioflavonoids. The bioflavonoids guard the skin against the damage of free radicals. Include many green leafy vegetables in your daily diet, such as cabbage, broccoli, spinach, and Brussels sprouts. The important phytochemicals found in these vegetables function as free radical scavengers in your body. They work effectively in protecting the skin from the sun’s the harsh effects and other environmental factors causing dry skin together with prematurely age skin. Add essential fatty acids to your diet. Dry skin requires essential fatty acids to help protect the outer lipid layer of the skin. However, make sure you are cooking or eating with the right fats. If you have psoriasis, avoid foods high in cholesterol and fat. Use olive oil for low-temperature cooking and canola oil for high-temperature cooking. For cooking, use un-hydrogenated vegetable oils. Include fiber in your diet. Fiber helps rid the body of toxic chemicals such as stress hormones, smog, smoke, and other environmental factors contributing to dry skin on face. But be careful when you fill up on fiber because excess intake of fiber prevents your body from absorbing vital nutrients and vitamins that are important for moist, healthy skin. Thus, for proper dosage, you should consult your doctor. Add foods containing lipoic acid to your diet because these can decrease dry skin on face and damage caused due to sun exposure. Lipoic acid rich foods include tomatoes, poultry, round steak, calf liver, and green leafy vegetables. There are several foods that can dry out the skin and even lead to wrinkles and fine lines. Here are some of the foods that make your condition worse. Packed And Processed Foods: Generally speaking, all the processed and packed foods are low in fiber and lack of nutrients. They are also full of sugars, refined carbohydrates, trans fats, and fructose and contain artificial ingredients. They have negative impacts on your skin such as wrinkles, dryness, rashes, and premature aging. Instead, you should munch on more vegetables and fruits, which contain adequate water content. Eating such foods help to eliminate all the toxins from your body, thus giving healthier skin. Too Much Intake Of Vitamin A: Vitamin A supplements are rich in antioxidants that are responsible for repairing your skin, cells, and tissues. 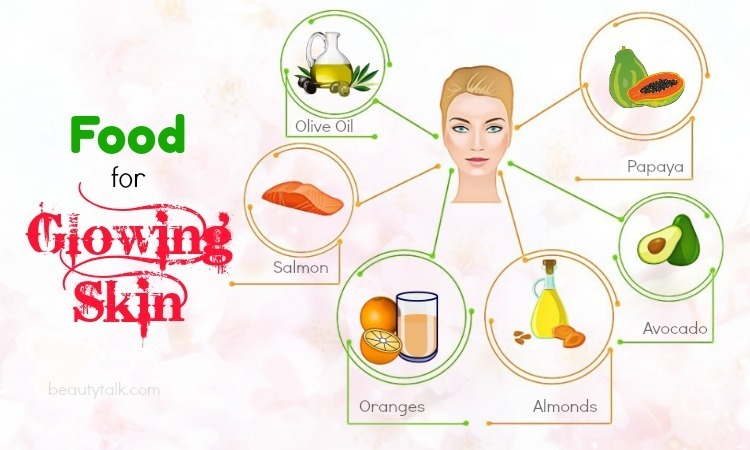 However, excess intake of this vitamin supplements can result in Hypervitaminosis, several kinds of health, and skin problems like dry peeling skin. Thus, it’s best to take the proper amounts of this vitamin in your diet. High-Glycemic Foods: Refined carbohydrates such as pasta, white rice, white loaves of bread, cookies, cakes, and white potatoes are some of the foods containing high glycemic that lead to blood sugar rush. Along with that, high glycemic foods can also lead to dry skin on face, early aging, clogged pores, and wrinkles. Instead, eat low glycemic foods including vegetables, greens, sweet potatoes, skim milk, seeds, brown bread, and low-fat yogurt. Inorganic Foods: Organically, organic foods are full of nutrients, minerals, and vitamins. Inorganic foods, on the other hand, are infused with fungicides, pesticide, and harmful chemicals, which affect your skin. Try avoiding these inorganic foods and opt for organic foods, living a healthy life. Alcohol: Alcohol can remove liquid from the body since it works as a diuretic. Less fluid can result in dehydration which contributes to dryness. Plus, it makes wrinkles and fine lines appear more pronounced. When going outside, it’s necessary to use a sunscreen to give your face protection from harsh UV rays. Sun damage is considered as one of the main factors contributing to most skin issues including the dry skin on face. So, you should wear a sunscreen with SPF of 30 all year-round before stepping out in the sun. Plus, you should also wear a hat or a scarf with a mask to help cover your face. 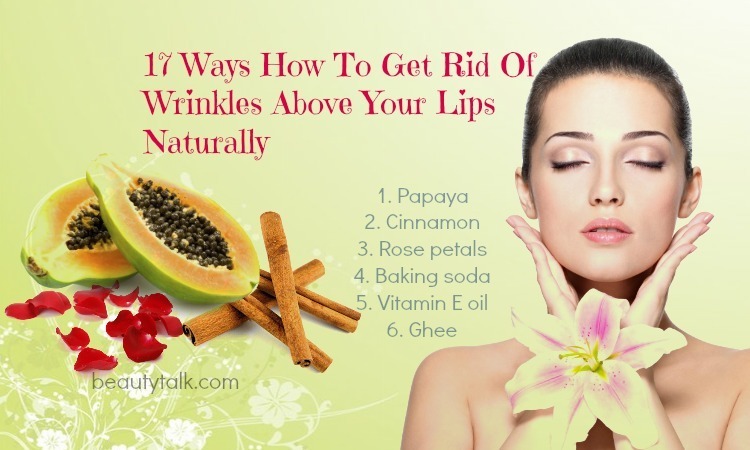 Along with that, use a lip balm with an SPF of 15 or higher to protect the skin on the lips. Generally speaking, body soaps are harsh for your facial skin, so you should search for a mild cleanser for the face. Lots of soap-based cleansers consist of sodium lauryl sulfate that steals away moisture. Non-sudsy cleansers or non-soap cleanser are a safe option for your face. You can also use a cleanser containing ceramides, a fatty molecule type found on the outer layer of the skin. Also, you need to avoid using cleansers with added fragrances because they contain some form of alcohol that can dry out the skin out. After washing the face, avoid rubbing a dry towel over the skin. Instead, use a dry, soft towel to pat your face dry gently. You should pat the skin dry for at least 20 minutes to reduce potential irritation as much as possible. Use a soft cloth made from fiber, or a soft terry cloth. Right after you wash your face, apply a moisturizing cream or lotion over it. Applying the moisturizer on the wet skin can be helpful for trapping more moisture on the skin for a long time. You should use a moisturizer containing Shea butter, stearic acid, ceramides, or glycerin because it assists you in replacing the outer protective layer on the skin responsible for maintaining the moisture inside. Dry skin is a thick layer of dead skin cells, which build up and start sloughing off. Eliminating this layer of dry and dead skin cells several times per week reveals you the healthy, fresh skin underneath. For exfoliating your skin, you can mix one tablespoon of honey with one teaspoon of ground oatmeal to make a scrub. Simply rub this mixture over your dry spots in one circular motion and rinse it off. Do not scrub the skin with a cloth or brush because it can damage and weaken the skin. Instead of water, you can also consider using milk to wash your face. Because milk has beneficial ingredients, it can cleanse and protect the skin. Particularly, milk comes with the lactic acid that is helpful for cleansing the skin. Apart from that, it has the lipid content that supplies the natural oil to the skin to stay moisturized. Using milk is an effective way to help moisturize the skin. Just fill a bowl with cold milk and immerse a baby washcloth in it. Then, drape it over the face and wait for roughly 10 minutes. Choose whole milk or 2 % milk to make sure that the facial skin looks soft, rehydrated, and plump. Do this milk cleansing method two or three times per week. Note: Milk won’t remove makeup, so ensure to fade away all traces of your makeup before using this method to cleanse your face. You should be gentle when you apply cleansers or soaps to your face. Just your fingertips and slightly rub your face. Do not scrub the skin on the face because this can lead to irritation. Plus, avoid washing your face many times per day. It’s best to wash your face at night if you are dealing with the problem of dry skin. Oil moisturizers often tend to be less oily than ointments, but they are still helpful for fighting dry skin on face. Examples include mineral oil, baby oil, and bath oil. Ointment moisturizers can trap the most moisture in the skin, but they can feel oily. An example of this kind of moisturizer is petroleum jelly (Vaseline). Lotion moisturizers feel the least greasy, but they are less moisturizing than the other choices because they are high in alcohol content. Cream moisturizers are more popular than other types of oils or ointments, as the skin easily absorbs them. Whenever you go out, don’t forget to cover your face. It’s important that you usually protect your face from the harsh UV rays of the sun with sunscreen. In the winter months, your skin often loses its ability to retain moisture. So, consider using a mask on dry and cold winter days to give your face protection from the harsh air. You can also wear a hat and use a scarf to cover the lower half of your face before heading outside. It’s vital to scrutinize your makeup routine for battling dry skin on face. Your makeup may consist of ingredients contributing to the problem of dry skin on face. It’s best to don’t wear makeup at all, but you can try to use oil-based cosmetics if you feel that you can’t go without makeup. 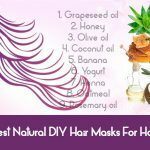 You should opt for makeup made with natural ingredients such as coconut oil, Shea butter, beeswax, and almond oil, as these items are effective at nourishing the skin and keeping it from drying out. Running a humidifier in the bedroom at night will significantly help to prevent dry air from dehydrating your skin on the face and forehead. It also aids in infusing additional moisture into the facial skin that prevents it from shedding too fast and flaking in the next day. Remember that keeping the humidity of your bedroom at 50 % is ideal. Placing a water container beside the radiator works may be also beneficial for keeping your bedroom humid in the winter. Occasionally, take some petroleum jelly and apply it over areas of the face. It’ll help to lock in the natural moisture of the skin. 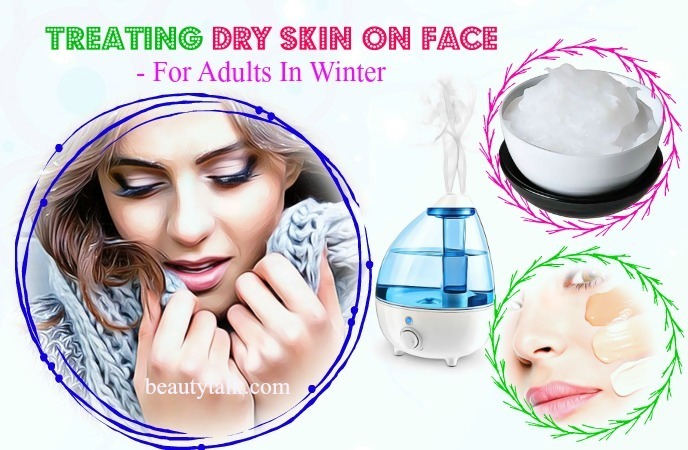 Especially, it can be beneficial during the winter when your facial skin is often exposed to drying air. Before stepping outside, apply the petroleum jelly for winter use. Apply some petroleum jelly over dry areas of the skin for year-round use. Allow it to remain for ten minutes and wash it off gently. Try this procedure twice per week. Oatmeal has been used to deal with eczema together with other dry skin conditions for centuries thanks to its soothing properties. 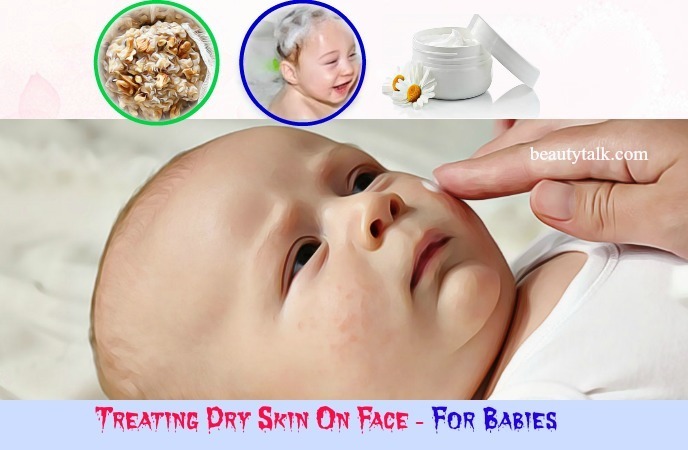 You can prepare a facial wash with oats to help remove the dry skin on face of your baby. Just take one cup of rolled oats and blend it in one food processor to get a powder. Add the powder to a basin of warm water and later mix everything well until the water becomes milky. Dip a clean face cloth in this water and place it on your baby's face. Avoid his or her eyes, mouth, and nose. It’s important to take care of the skin of your baby carefully. This will help lessen any discomfort or pain caused due to the dry patches. Keep fingernails of your baby trimmed, so she or he does not scratch the dry patches. You can take a clean face cloth and immerse it in cool water to make a compress to apply to your baby’s skin to soothe itching. Stay away from clothes made from rough materials and all possible irritants, such as moisturizers and lotions containing alcohol. Also, keep the room temperature of your baby no higher than 65 °F to stop her/his overheating that can exacerbate the dryness. Water removes natural oils from the skin, so an ideal way is to keep washing to a minimum. Instead of using hot water, use warm water to wash your little one’s face with a soap-free, fragrance-free cleanser. When taking your baby out of the bath, pat her or his skin dry and apply a moisturizer to the dry patches quickly to lock in moisture. Two of the most excellent moisturizers for your baby’s dry skin are aloe vera and petroleum jelly. The anti-inflammatory and natural moisturizing properties of aloe vera gel are ideal for rehydrating a baby's dry skin. Just apply some gel to the problem parts of the skin of your baby and let it soak in thoroughly. Redo it at least twice per day, or as needed. Petroleum jelly is excellent rehydrating the skin and sealing in moisture. Apply a very thin layer of petroleum jelly to the dry patches after washing and patting dry the face of your little one. Allow it to absorb into his or her skin. Due to its moisturizing properties, olive oil helps not nourish the skin effectively. This oil additionally aids in counteracting the damaged caused due to the sun because of its polyphenols. Lavender oil in this remedy has been used for treating a multitude of skin issues including the dry skin on face. It’s highly beneficial for soothing irritation, and itchiness caused due to the dry skin, as it embraces anti-microbial and anti-inflammatory qualities. Just mix the olive oil and lavender oil well. Massage this concoction into your face and use a washcloth to remove the excess oil. Use this remedy every night, before sleeping. Lavender essential oil can lead to skin irritation if used in large volumes or undiluted. Because it holds moisturizing properties, banana can provide immediate relief from the dry skin on face. 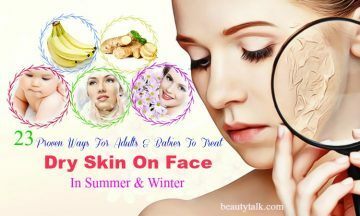 Besides, it comes with anti-wrinkle properties, which make it a fantastic treatment to opt for since dry skin is more likely to developing wrinkles and fine lines. 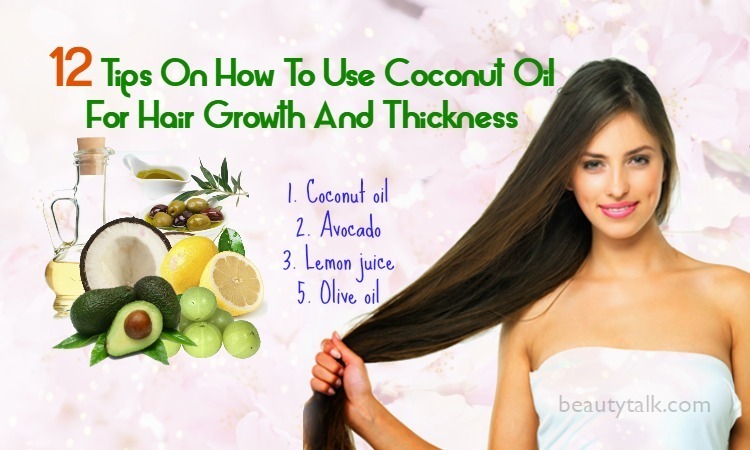 Coconut oil is rich in fats, which deeply condition the skin, leaving it supple and smooth. With the help of the back of a spoon, mash the banana and stir it in the coconut oil to create a smooth paste. 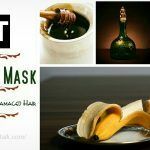 Start applying this mask to your face and rinse after about 20 minutes with cold water. Reapply this face mask 1-3 times per week. Overconsumption of banana may outcome in the nerve damage or injury. However, it’s likely safe when applied to the skin. Ginger is a rich source of gingerols that contain antioxidant properties to help decrease the free radical damage. It also holds anti-inflammatory compounds, which work wonders in treating the underlying causes, dryness, and dullness to a great extent. Extract the fresh ginger juice at first and later add the rose water and honey to it. Then, mix these components well and apply it to your face with or a face pack brush or your fingertips. Let the mixture stay for ten minutes before rinsing it off. For best results, reapply it 1 or 2 times per week. Ginger is likely safe when applied to the skin short-term, appropriately. For some people, it might cause the skin irritation. Aloe gel is a therapeutic herb that contains anti-inflammatory and anti-fungal properties. 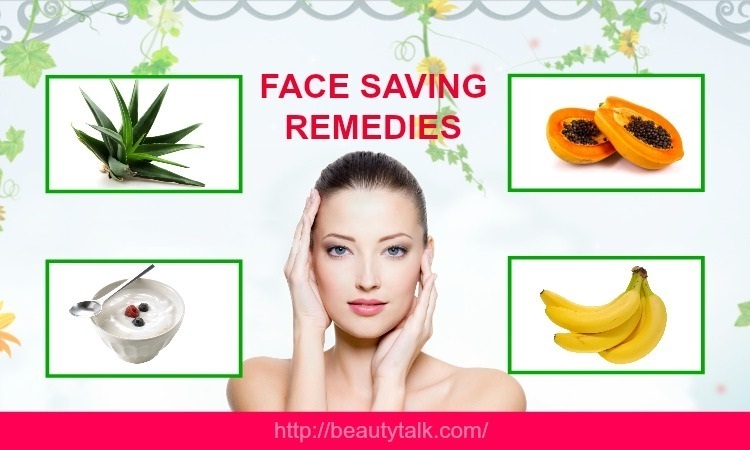 These properties are helpful for healing the dry patched skin. It has 90 percent of liquid that helps to soothe skin and decrease itchy irritations and red patches caused due to dryness. Along with that, the gel is abundant in antioxidants, vitamins, minerals and enzymes, which can nourish the skin and provide a deep moisturizing effect to it. Vitamin E oil in this recipe can rid the body of free radicals, which cause the dryness of skin and aging process. Mix the above elements well and apply the mixture to your cleansed face. Keep this application for 30 to 40 minutes while gently massaging it. After that, wipe it off with a clean and damp cotton cloth and finally, apply a moisturizer. Use the home remedy every day to get instant result. You need to seek a dermatologist’s advice if you’re prone to breakouts or have oily or normal skin. Vitamin E can increase the risks of breakouts because it’s a heavy humectant. Owing to its moisturizing agents, almond oil is a potential remedy for treating dry skin on face, thus making the skin smooth and supple. It further improves your skin tone and complexion. Geranium oil is used commonly in skin care because it possesses an anti-inflammatory and antiseptic agent. 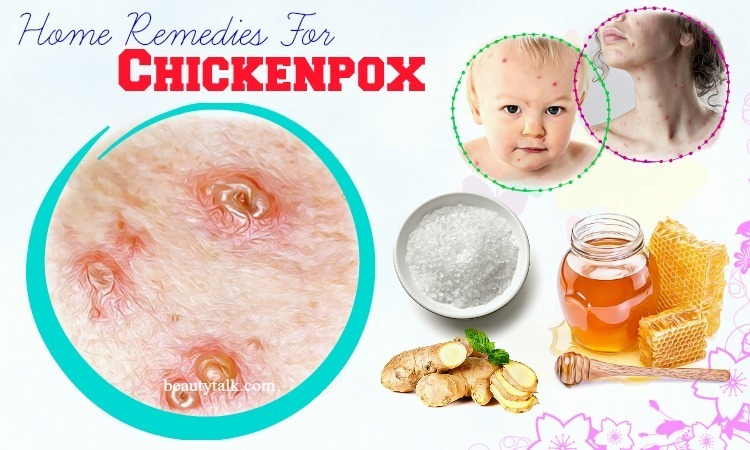 It is also useful for curing conditions such as eczema, a reason for dry skin. Pick up the prepared almond oil and transfer it into a sterilized glass bottle. Then, add the geranium oil to it and shake this bottle well to combine. Use this liquid in place of your regular moisturizer. Use it nightly to reap the optimum benefits of this treatment. The large intake of almond oil can trigger weight gain. But applying it to your skin may be likely safe. As we know, turmeric exhibits an active ingredient named curcumin that owns most of its beneficial agents. Regular application of turmeric on your face is effective for moisturizing and rejuvenating the skin cells. It will also improve the texture of the skin and brighten up the complexion. Combine everything to have a smooth paste and apply it to your facial skin. Let the face pack dry for fifteen minutes and afterward, rinse with cool water. Repeat the application once or twice weekly. When consumed in large quantities, turmeric can lead to some side effects such as itchy skin, redness, vomiting, nausea, diarrhea, cramping, bloating, and excess flatulence. Use a mild cleanser along with lukewarm water to wash your face every day. Apply lotion after your bath or shower to lock in moisture. Moisturize dry skin by using petroleum jelly. Opt for skin care products that suit the type of your skin – combination, dry or oily. Wear a broad-spectrum sunscreen with at least SPF 30 to protect your skin. a. Does Bathing Make The Skin Dry? Rinsing your face with hot water can make the skin dry. Hot water leaves the skin dry and dull by removing the oils from it. Besides, using harsh soaps can flush the natural oils out of the skin. Instead, you should use a mild cleanser for your face. b. What Care Should Be Taken For Dry Skin In Summer? It’s recommended to use a right moisturizer and right soap to manage the dry skin on face. You can also add natural ingredients such as cucumber, honey and aloe vera to your skin care regime. During the hot summer months, make sure to stay hydrated and fresh. In the summer, the body sweats, thereby losing a lot of water and it needs to be replenished. Drink 1 to 2 liters of water daily to keep the skin hydrated and fresh. c. What Can You Put On Dry Skin Of A Newborn? Many skin moisturizers or lotions available on the market contain ingredients that are safe when using on toddlers and newborns. Check with your doctor to select the safe moisturizer for your baby’s skin. In this case, home remedies aren’t recommended because the skin of a newborn is very sensitive and may react to lots of ingredients. 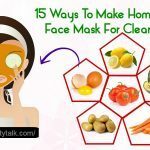 We hope that this article has provided you with easy-to-use tips and natural beauty remedies to treat the dry skin on face. Also, share any tip or remedy with us if you know other easy ways for both adults and babies to treat dry skin on face in summer and winter. All of the contents provided in this article are for informational & educational purposes. We recommend you consult a healthcare professional to determine which method is appropriate for you.